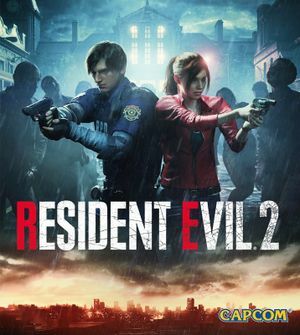 This page is for the remake of Resident Evil 2. For the original game, see Resident Evil 2. Features many graphical options with visual demonstrations for each. Default brightness gives the game a washed out blue hazy look. 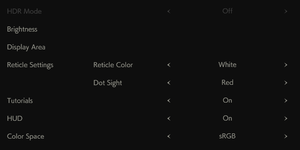 Those who prefer true black levels can use a guide here. According to Digital Foundry's video analysis, enabling Shadow Cache may increase performance by 25%. 8.1 "This extra save data is not compatible and cannot be used"
So far, only known to release in European territories. The Deluxe Edition includes all the DLC minus the pre-order bonus. 16:10 and 4:3 are letterboxed. See the WSGF topic. Hor+ gameplay with pillarboxed cutscenes at 21:9. Vert- at 32:9. See the WSGF topic. The included FOV slider is limited. FXAA, TAA, FXAA+TAA and SMAA. Zombies animate at 30 FPS when at a distance (see Issues fixed). Knife damage is tied to frame rate. Resident Evil 2 has a very strong vignette. While some may feel being unable to see the left and right sides of the screen adds to the horror, others may feel it is annoyingly dark and like looking through a telescope. This is the game with vignette on and this is vignette off. Press F5 for no vignette. Breaks mirror reflections and some shaders. Causes visual bugs in the main menu and possibly in game as well. Open re2.exe in a hex editor, e.g. HxD. If a mistake is made and the file gets corrupted, verify the game files through Steam to restore it to its original state. Press F4 for no sharpening. Forced negative mouse acceleration and deadzone. No known way to disable it. Individual sliders for camera and aiming. In-game voice and text can be changed to separate supported languages. See Helix Mod: Resident Evil 2. This may occur when the helicopter comes. The survival knife does variable damage based on the current frame rate. The game can display an incorrect amount of VRAM for you GPU in the graphics menu. Does not affect performance or available graphics options. The game may warn you that you will experience poor performance at high settings, but as long as your GPU's actual VRAM is sufficient this is not true. "This extra save data is not compatible and cannot be used"
Saved games are tied to whatever region Windows is set to, so it can cause issues with cloud-saves across computers. 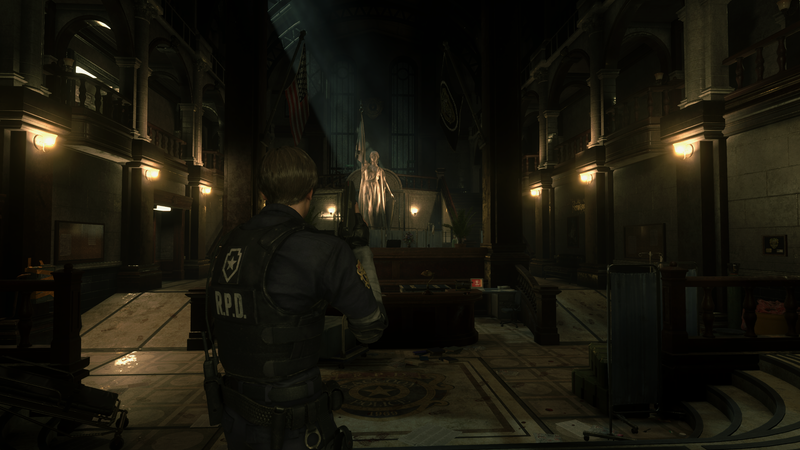 Sometimes, the game may become very dark, such as when standing near the stairs in the main hall, or even simply exploring the RPD. Then at other times, it may become too bright. Try installing latest video drivers. Lower the image quality, such as from 100% to 50%. Turn off Screen Space Reflections in options. Cap the framerate at 30 or 60, not Variable. Try changing around windowed/fullscreen/borderless fullscreen mode. Disable anything with "shadow" in options (Shadow Cache, Contact Shadows). Try changing from Directx 12 back to 11. 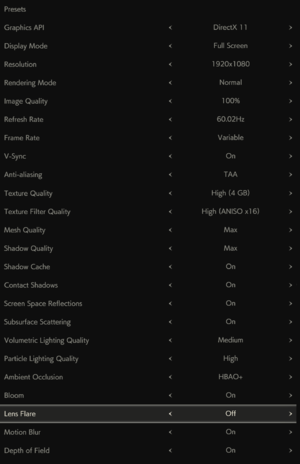 Try increasing the texture quality to use 2GB or more of VRAM. It is set to 0.5GB by default. Try changing Ambient Occlusion settings, watching for screen darkening/brightening. Some potential fixes, specifically setting Shadow Cache to off, will have a negative impact on performance. 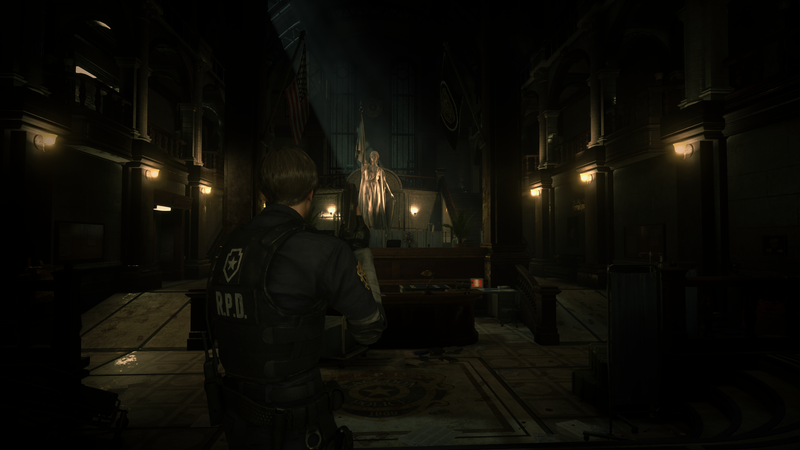 Resident Evil 2 is known to have stutters for many players. Apart from the possible fixes under "Game becomes too dark/bright at times", another method is to increase the paging file size. Resident Evil 2 uses heavy resources on a PC's paging file, which acts as alternate virtual RAM. If the paging file is set too low (such as a maximum of 2GB), this can act as a performance bottleneck, resulting in frequent stutters while exploring. This is especially true if the system's RAM is 8GB and under. Increasing the paging file size (such as from 2GB to 8GB) can drastically improve performance and reduce stutters. Open start menu, type "run" and use run command. Enter systempropertiesadvanced. Go to "Advanced" tab and click settings. Go to "Advanced" and choose "programs" instead of "background services". Under virtual memory, click change. Uncheck "Automatically manage paging file for all drives" at the top. Select custom size. Although there is no definitive paging file size, try making the initial and maximum both 12288. Click OK and restart your computer. Try the game to see if performance is improved. Even if you play at 60 or variable (uncapped) FPS, zombies still animate at a maximum of 30 FPS when they are far from the player. Open re2.exe with an hex editor such as HxD. Find E9 EB EA 39 0C CC CC CC CC CC CC. Replace with 41 B8 00 00 00 00 E9 E5 EA 39 0C. The computer in the main hall may cause the game to either freeze or cause the screen to become grey, making it unplayable. This will result in lower overall frame rates. The mouse and keyboard may stop responding if you Alt+Tab ↹ out or after a cutscene ends. The game relies on the presence of Windows Media Player and its codec. ↑ 2.0 2.1 File/folder structure within this directory reflects the path(s) listed for Windows and/or Steam game data (use Wine regedit to access Windows registry paths). Games with Steam Cloud support may store data in ~/.steam/steam/userdata/<user-id>/883710/ in addition to or instead of this directory. The app ID (883710) may differ in some cases. Treat backslashes as forward slashes. See the glossary page for details. "[starting at timestamp 3:46] ...Then you have the general issues of color-correction and black levels. And [sic] in spite of what you may read online and elsewhere, the game really does not want you to have pitch-dark blacks in most scenes." "[starting at timestamp 7:55] Here, I can only recommend leaving Shadow Caching on, as turning it off can result in a 25% performance loss with no visual gain." In my case, the graphics menu states I have 0.15GB of memory. ↑ Steam forums - STUTTERING FIX! "[starting at timestamp 2:28]...But first, let's get some basics out of the way. The game's performance profile on PC and its visuals are 99% that which we saw in the demo. That's both great since the demo showed how blisteringly-fast the RE Engine can be, and it's also bad because of the problems held over from the demo [DX12 performs worse than DX11]." "have u tried changing the steam hotkeys to brinup steam ui? i have mine set to + key on numpad and i my son run into the issue so he now using same keybinding and not had the issue since"